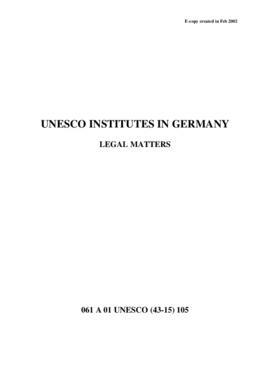 Legal instruments (LA) Collection: agreements, conventions, recommendations, final acts, plans of operation, protocols, contracts, statutes, credentials, full powers of the Delegates of the General Conference, etc., that have been transferred to the Archives. Central Registry Collection: official correspondence files (also called 'registry files' and 'subject files on programme maters') contianing documents collected from Secretariat units and organized according to a subject-based classification scheme by the former Registry Section. Secretariat fonds: records created and maintained by the organizational units of the Secretariat in the course of their activities, such as, for example, the Executive Office of the Director General (CAB), Bureau of Studies and Programming (BEP, PSP), Secretariat of the General Conference and the Executive Board (SCX), etc. The fonds includes records of committees and commissions that reported to the Director-General. The filing plan used for programme sector of the Secretariat (1946-1996) files, which are the main records of this fond, is mainly based on the Universal Decimal Classification (UDC) system. The UDC structures information and files according to subject words in a codification system developed as a cataloguing tool for libraries. Since 1996, most programme sector files are organised according to decentralized filing plans, which reflect the provenance of the records. These are therefore arranged with the Secretariat Fonds. The inventories of archives originating in the central and administrative services have respected the traditional, archival provenance principle since the establishment of the Secretariat in 1946 and also form part of the Secretariat fonds. 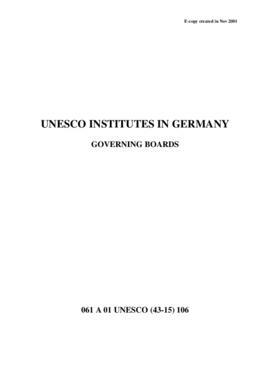 The Rules governing access to the archives by external researchers are established in the UNESCO Administrative Manual, Appendix 9.5a. Access to a document or file not yet within the open consultation period may be granted by the Chief Archivist on an exceptional basis with the agreement of the appropriate official(s) or unit(s) of the Secretariat. Created by Julia Pohle, June 2009. Revised slightly AWT 20 March 2012.